Scott Sumner had a terrific post today. The title said it all, but the rest of it wasn’t bad either. Scott hit it right on the nose with that one. It reminded me of something, so I went an looked it up in a book I happen to have at home. Here’s what it says about Fed policy coming out of the 1981-82 recession. The renewed stringency forced interest rates to rise slightly while driving the dollare ever higher and commodities prices ever lower. Yet the recovery, once under way, was too powerful to be slowed down perceptibly by the monetary pressure. . . . The recovery continued in the first half of 1984. But the amazing strength of the recovery pulled the growth of M-1 above its targets, reviving fears that the Fed would have to tighten. Instead of being welcomed, each bit of favorable economic news – strong growth in real GNP, reduced unemployment, higher factory orders – was greeted with fear and trepidation in the financial markets, because such reports were viewed as portents of future tightening by the Fed. Those fears generated continuing increases in interest rates, appreciation of the dollar, and falling commodities prices. In the summer of 1984, monetary stringency and fears that the Fed would clamp down even more tightly to bring the growth of M-1 back within its targets were threatening to produce a credit crunch and abort the recovery. With interest rates and the dollar’s exchange rate again starting to rise rapidly, and with commodity prices losing the modest gains they had made in the previous year, the recovery was indeed threatened. In late July of 1984, two years after the Fed had given up its earlier effort to meet its monetary targets, the conditions for a credit crunch, if not a full scale panic, were again developing. The most widely reported monetary aggregate, M-1, was above the upper limit of the Fed’s growth target, and economic growth in the second quarter of 1984 was reported to have been an unexpectedly strong 7.5%. Commodities prices were practically in free fall and the dollar was soaring. Once again, however, a timely intervention by Mr. Volcker calmed the markets and put to rest fears that the Fed would strive to keep monetary growth within the announced target ranges. Appearing before Congress, he announced that he expected inflation to remain low [around 4%!!!] and that the Fed would maintain its policy without seeking any further tightening to bring monetary growth within the target range. 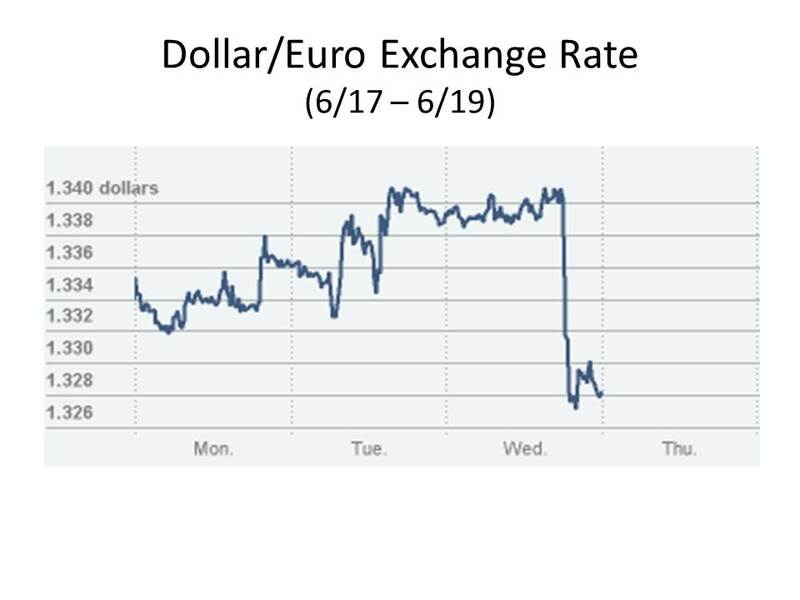 This assurance stopped, at least for a brief spell, the dollar’s rise in foreign exchange markets and permitted a slight rebound in commodities prices. Mr. Volcker’s assurance that monetary policy would not be tightened encouraged the public to stop trying to build up precautionary balances. As a consequence, M-1 growth leveled off even as interest rates fell back somewhat. All the while Monetarist were loudly protesting the conduct of monetary policy. Before the Fed abandoned its attempt to target M-1, Monetarists criticized the Fed for not keeping monetary growth steady enough. For a time, they even attributed the failure of interest rates to fall as rapidly as the rate of inflation in 1981, or to fall at all in the first half of 1982, to uncertainty created by too much variability in the rate of monetary growth. Later, when the Fed abandoned, at any rate deemphasized, monetary targets, they warned that inflation would soon start to rise again. In late 1982, just as the economy was hitting bottom, Milton Friedman was predicting the return of double-digit inflation [sound familiar?] before the next election. What book did I get that from? OK, I admit it. It’s from my book Free Banking and Monetary Reform, pp. 220-21. So we’ve been through this before. When the Fed adopts a crazy reaction function in which it won’t tolerate real growth above a certain threshold, which is what the Fed seems to have done, with the threshold at 3% or less, funny things start to happen. How come no one is laughing? PS I apologize again for not replying to comments lately. I am still trying to cope with my workload. 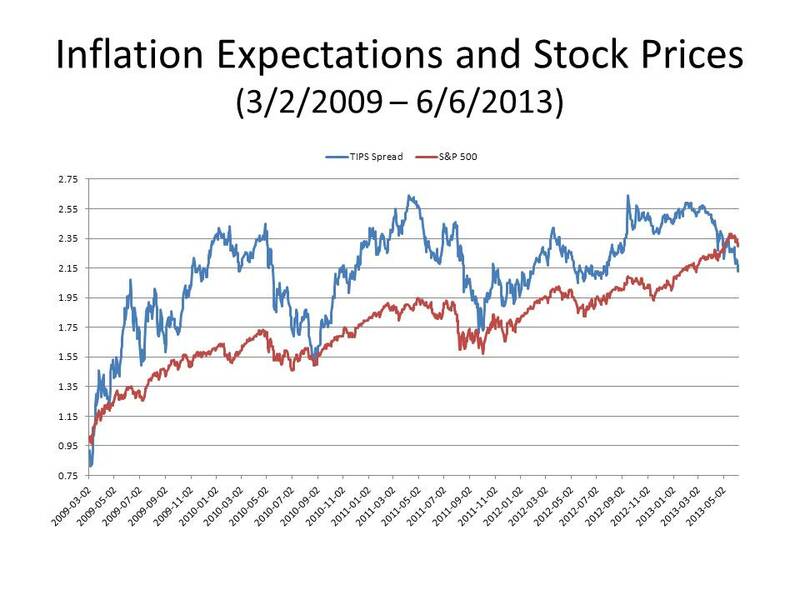 I have been writing a lot lately about movements in the stock market and in interest rates, trying to interpret those movements within the framework I laid out in my paper “The Fisher Effect Under Deflationary Expectations.” Last week I pointed out that, over the past three months, the close correlation, manifested from early 2008 to early 2013, between inflation expectations and the S&P 500 seems to have disappeared, inflation expectations declining at the same time that real interest rates, as approximated by the yield on the 10-year TIPS, and the stock market were rising. However, for the past two days, the correlation seems to have made a strong comeback. 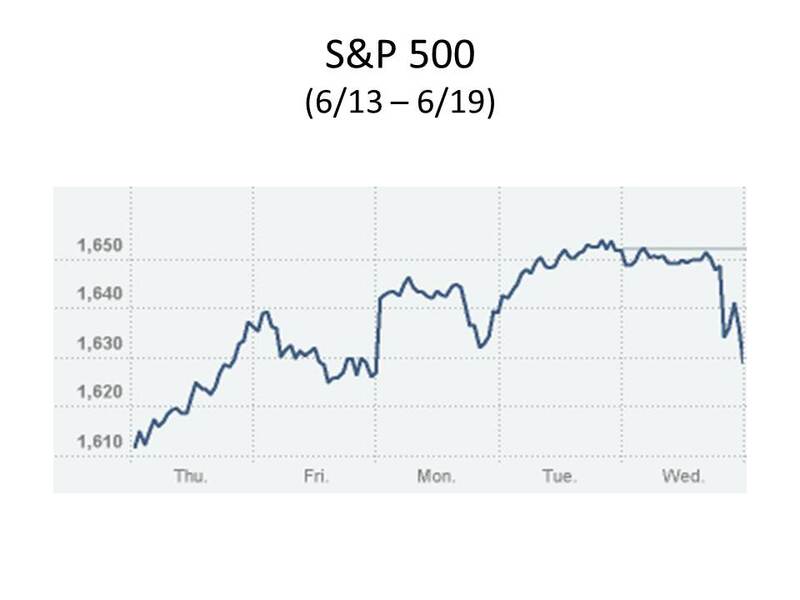 The TIPS spread declined by 8 basis points, and the S&P 500 fell by 2%, over the past two days. (As I write this on Wednesday evening, the Nikkei average is down 5% in early trading on Thursday in Japan.) Meanwhile, the recent upward trajectory of the yield on TIPS has become even steeper, climbing 11 basis points in two days. Now there are two possible interpretations of an increase in real interest rates. One is that expected real growth in earnings (net future corporate cash flows) is increasing. But that explanation for rising real interest rates is hard to reconcile with a sharp decline in stock prices. The other possible interpretation for a rise in real interest rates is that monetary policy is expected to be tightened, future interest rates being expected to rise when the monetary authority restricts the availability of base money. 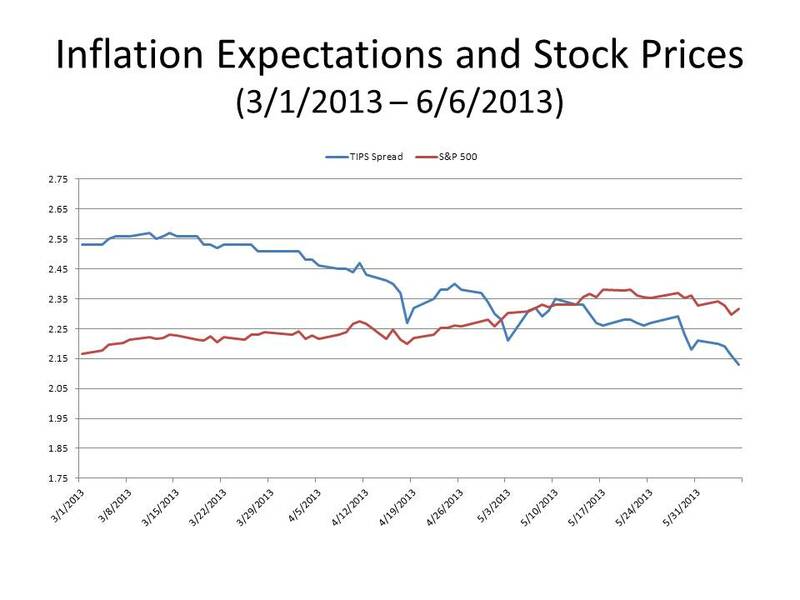 That interpretation would also be consistent with the observed decline in inflation expectations. For almost three weeks since Bernanke testified to Congress last month, hinting at the possibility that the Fed would begin winding down QE3, markets have been in some turmoil, and I conjecture that the turmoil is largely due to uncertainty caused by the possibility of a premature withdrawal from QE. This suggests that we may have entered into a perverse expectational reaction function in which any positive economic information, such as the better-than-expected May jobs report, creates an expectation that monetary stimulus will be withdrawn, thereby counteracting the positive expectational boost of the good economic news. This is the Sumner critique with a vengeance — call it the super-Sumner critique. 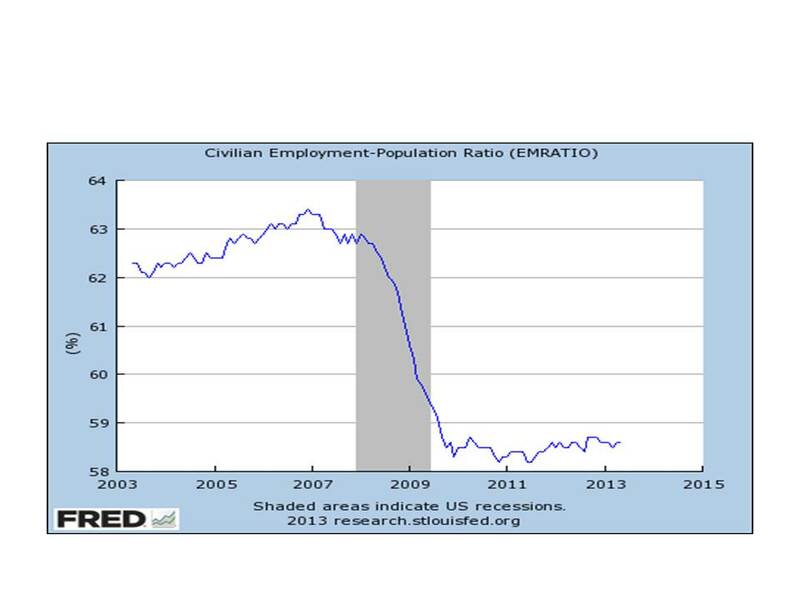 Not only is the government-spending multiplier zero; the private-investment multiplier is also zero! Now I really like this story, and the catchy little name that I have thought up for it is also cute. But candor requires me to admit that I detect a problem with it. I don’t think that it is a fatal problem, but maybe it is. If I am correct that real interest rates are rising because the odds that the Fed will tighten its policy and withdraw QE are increasing, then I would have expected that expectations of a Fed tightening would also cause the dollar to rise against other currencies in the foreign-exchange markets. But that has not happened; the dollar has been falling for the past few weeks, and the trend has continued for the last two days also. The only explanation that I can offer for that anomaly is that a tightening in US monetary policy would be expected to cause other central banks to tighten their policies even more severely than the Fed. I can understand why some tightening by other central banks would be expected to follow from a Fed tightening, but I can’t really understand why the reaction would be more intense than the initial change. Of course the other possibility is that different segments of the markets are being dominated by different expectations, in which case, there are some potentially profitable trading strategies that could be followed to take advantage of those differences. It wasn’t so long ago that we were being told by opponents of stimulus programs that the stimulus programs, whether fiscal or monetary, were counterproductive, because “the markets need certainty.” Well, maybe the certainty that is needed is the certainty that the stimulus won’t be withdrawn before it has done its job. PS I apologize for not having responded to any comments lately. I have just been swamped with other obligations. Last Thursday night, I dashed off a post in response to accusations being made by Chinese and South Korean critics of Abenomics that Japan is now engaging in currency manipulation. When I started writing, I thought that I was going to dismiss such accusations, because Prime Minister Abe has made an increased inflation target an explicit goal of his monetary policy, and instructed the newly installed Governor of the Bank of Japan to meet that target. However, despite the 25% depreciation of the yen against the dollar since it became clear last fall that Mr. Abe, running on a platform of monetary stimulation, would be elected Prime Minister, prices in Japan have not risen. It was also disturbing that there were news reports last week that some members of the Board of Governors of the Bank of Japan voiced doubts that the 2% inflation target would be met. Some of the members of the Bank of Japan (BOJ) board were doubtful about achieving the 2% inflation target projected by the bank within the two-year time frame, according to the latest minutes of the policy meeting. Why a 25% decline in the value of the yen in six months would not be enough to raise the rate of inflation to at least 2% is not immediately obvious to me. In 1933 when FDR devalued the dollar by 40%, the producer price index quickly jumped 10-15% in three months. Moreover, the practice of currency manipulation, i.e., maintaining an undervalued exchange rate while operating a tight monetary policy to induce a chronic current-account surplus and a rapid buildup of foreign-exchange reserves, was a key element of the Japanese growth strategy in the 1950s and 1960s, later copied by South Korea and Taiwan and the other Asian Tigers, before being perfected by China over the past decade. So despite wanting to defend the new Japanese monetary policy as a model for the rest of the world, I couldn’t conclude, admittedly based on pretty incomplete information, that Japan had not reverted back to its old currency-manipulating habits. I don’t follow this. Why aren’t you looking at the Japanese CA balance? Scott, Answer 1, CA depends on many things; FX reserves depends on what the CB wants. Answer 2, I’m lazy. Answer 3, also sleep deprived. Japan‘s current-account surplus rose in March to the highest level in a year as a depreciating yen boosted repatriated earnings and brightened the outlook for the nation’s exports. The excess in the widest measure of trade was 1.25 trillion yen ($12.4 billion), the Ministry of Finance said in Tokyo today. That exceeded the 1.22 trillion yen median estimate of 23 economists surveyed by Bloomberg News. Prime Minister Shinzo Abe’s revamp of Japan’s central bank to focus on ending deflation paid off when the yen today slid past 101 for the first time since 2009, helping exporters such as Toyota Motor Corp. (7203), which now sees its highest annual profit in six years. Sustaining a current-account surplus may help to maintain confidence in the nation’s finances as Abe wrestles with a debt burden more than twice the size of the economy. The cost of a weaker yen is higher import costs, reflected in a ninth straight trade deficit in March. The current-account surplus was 4 percent lower than the same month last year and the income surplus widened to 1.7 trillion yen, the highest level since March 2010, the ministry said. So contrary to what one would expect if the depreciation of the yen were the result of an inflationary monetary policy causing increased domestic spending, thereby increasing imports and reducing exports, Japan’s current account surplus is approaching its highest level in a year. Then, on his blog, responding to a commenter who indicated that he was worried by my suggestion that Japan might be engaging in currency manipulation, Scott made the following comment. Travis, I had trouble following David’s post. What exactly is he worried about? I don’t think the Japanese are manipulating their currency, but so what if they were? OK, Scott, here is what I am worried about. The reason that currency debasement is a good and virtuous and praiseworthy thing to do in a depression is that by debasing your currency you cause private economic agents to increase their spending. But under currency manipulation, the desirable depreciation of the exchange rate is counteracted by tight monetary policy designed to curtail, not to increase, spending, the point of currency manipulation being to divert spending by domestic and foreign consumers from the rest of the world to the tradable-goods producers of the currency-manipulating country. Unlike straightforward currency debasement, currency manipulation involves no aggregate change in spending, but shifts spending from the rest of the world to the currency manipulator. I don’t think that that is a good thing. And if that is what Japan is doing – I am not saying, based on one month’s worth of data, that they are, but I am afradi that they may be reverting to their old habits – then I think you should be worried as well.